Piper is a 15 year old who lives in Midcoast Maine, US. A year ago, Piper heard about a new way to learn, and decided to take part in a new learning experience called the Maine Networked Learning Project. Known as “the Mesh” to participants, this learning ecology offered Piper the chance to apply her passion for learning in highly experiential and collaborative ways with groups of young people of varied ages, adult and youth mentors with knowledge territory specialties and organizations focused on ensuring sustainable and resilient societies, economies, and the environment. This is a snapshot of her day. Piper gets ready for her week by sitting outside sipping tea and looking at her smart phone. She is checking project updates sent from the team she has been working with for the last two months on her Google Reader and Twitter feed. The project Piper is checking in on deals with food justice in the rural communities of her bioregion. Seeing many updates, and much activity she decides to look at the overall “mesh” schedule for the day. She notices that the MNLP van will be moving across the local region starting in an hour. To get a ride on this local transportation system she has to ride her bike to a station stop or have her parents drop her off at the regional mesh meet-up location. But before deciding this she reviews her weekly schedule on her mobile. Piper notices that she and three others will be presenting at the local Veterans of Foreign Wars organization to a large group on the history of local food cultivation in the region. She and her Food Justice project group have spent a good deal of time completing ethnographic studies of the areas “locals”. These participant interviews are seminal to their presentation as they show that local sustainability and resilience projects are not “outside” or “rich Peoples” pursuits, but can save local economies and the historical heritage this stakeholder group cherishes. The group has also been working in restoration crews on local farms as a service learning tie in to their studies. The project has been extensive. 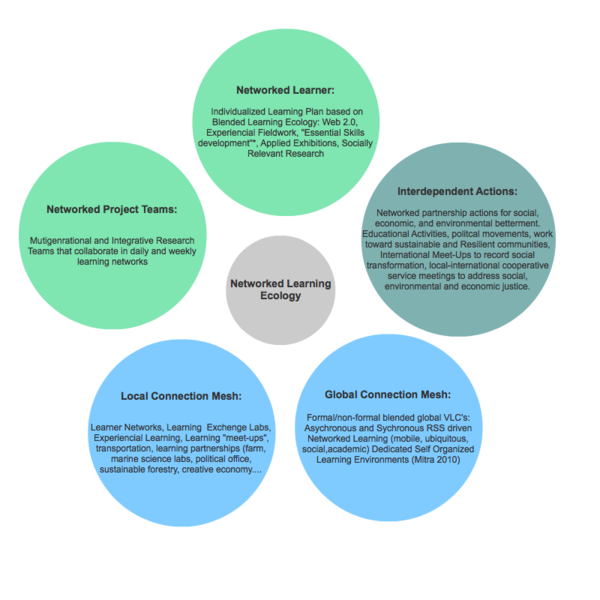 Piper and her group have covered mathematics, experimental sciences, writing, social sciences and much more in an integrated project framework. They have relied on their mesh mentors, local experts, and the internet for research, recording (writing, video) and exhibiting their knowledge and understanding to multiple community stakeholder groups. As the project presentation pre-work is done, Piper contacts her group via twitter hashtag to remind all that they will need an hour to meet-up before the presentation and to ride their bikes to the VAW hall from the meet-up. Immediately she gets a response from three of the four other group members that they will meet prior to the VAW event. They remind each other that a collaborative learning session will be going on for applied algebra and trigonometry concepts at Noon. This session will be special, as an innovative regional planner from rural Scotland will be mentoring at the Self Organizing Learning Environment today along with their local quantitative reasoning/systems thinking mentors. She video chats with one participant letting her know that she will be at the SOLE, and is hoping to get a ride to her house after today’s VAW presentation. That done, Piper checks with her parents and decides to ride her bike to a mesh station stop. She then rides the mesh van into town and catches up on posts and replies in her Reader on the way. At the Meet-up location (a wide open space that reminds Piper of a open market of some kind), she settles in with the other young people in study, discussion and deliberation. Today she takes out her tablet and reads a work in global literature that was suggested by a mentor she has in South Asia. She will take notes on the work over the next hour and send those notes via blog post to the mentor. The mentor, other participants and Piper are involved in a global project combining cultural understandings of place into a wiki resource for future learners to use. She sees connections everywhere in her learning and after being inspired by an experience in India she’s just read about, Piper adds content for today’s VFW presentation to the shared presentation document for group review. Piper takes a run with others from the meet-up, and then decides to review the quantitative reasoning skills that figure into the edible re-vegetation project from Scotland being discussed at the SOLE today. Piper will get another chance to apply her growing knowledge and understanding with today’s SOLE because the re-vegetation work they are doing locally is based on the Scottish project being discussed. After the SOLE, and successful VAW presentation the group meets at a Mesh group members house. The group has grown from five to seven now as the crew who filmed the presentation and ethnographies over the last monthes are with them to discuss editing and working on the script for the groups public exhibition of findings. Piper and her group know that the scientists, mentors, politicians, local, global participants, and their peers will attend the exhibition. This step in their project leads to funding and further action on their multi-year food security project. After Dinner with the host family, rides home for most, and ePortfolio updates the rest of the week will be full of networked, experiential, and mobile learning directly applied to creating solutions in an interdependent world.